Markita Brooks was raised in Hampton, VA. She is married and has two children. Markita is the founder and senior apostle of The Truth In The Spirit. On March 13, 2001, God spoke “The Truth In The Spirit” to her and inspired her to help youth. He then used her to birth this organization, which was incorporated on July 17th, 2001. Since this time, God has continued to develop Markita and The Truth In The Spirit into agents of transformation and empowerment for individuals, businesses, organizations, ministries and young people. 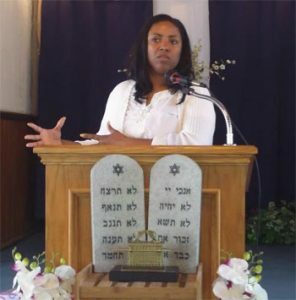 Markita was ordained by Messianic Rabbi Eric Carlson, leader of Congregation Zion’s Sake, who provides guidance and accountability for The Truth In the Spirit, connecting the organization to the Hebrew Roots of the Christian Faith. Markita has a Bachelor’s degree in Leadership Studies from the University of Richmond. She has worked in youth development for 20 years and is a certified trainer by the National Training Institute in the “Advancing Youth Development” Training Series as well as the 4MAT System for teaching to the natural learning cycle. Markita has worked with the elderly and impaired for 25 years serving in direct care and administrative roles in various assisted living and transitional housing facilities. She is the published author of The Road to Damascus: Transformation for the Next Level as well as various other booklets and trainings. She is a member of the International Who’s Who of Professional Management, and she was featured in Hampton Roads Professional Woman Magazine in June of 2011. Markita is also a business coach and consultant and has worked with various businesses over the past 20 years. She has been an entrepreneur since 2001, and she is the founder and CEO of Kingdom Wealth, LLC, a business coaching and consulting firm “creating wealth to do the MOST GOOD.” Markita is a preacher, teacher, writer, trainer, worshipper, coach, consultant, youth worker, and adult care provider. Please enter the best number to contact you about the following up on request. Will you be responsible for the travel and lodging accommodations for the requested speaker? Please explain any travel and lodging accommodations.